UL & C UL approved. 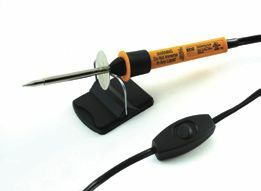 Temperature equivalent to standard 45W soldering iron. Tip temperature +950°F (+510°C.) Handy in-line ON/OFF switch. Includes safety stand, soldering iron and conical needle tip.